Finally, OC Foodie Fest is Tomorrow! Are You Ready? It feels like we have been waiting for months for the OC Foodie Fest to finally get here. Maybe it is because we have seen all of the media coverage or maybe it is because of all of the pink and white fliers we see promoting the event on all of the trucks that are participating. Or it could be the preview events and lunch food courts. No matter the reason, the wait is almost over. Tomorrow is the big day! Fifty gourmet food trucks along with dance crews and small, local businesses will be at the Honda Center in Anaheim. I’m sure I’m not alone when I say, I feel like a kid on Christmas Eve, waiting for Santa to come. It will definitely be hard to sleep tonight! I am really hoping this event is a success, not just because a portion of the proceeds support local charities, but also because it will expose Orange County to the “gourmet” food truck scene and hopefully remove the “roach coach” stigma once and for all. These mini kitchens on wheels are doing some amazing things with food and provide so many different cuisines and fusions to fit any palette. There is an OC truck that bakes everything on the truck! Another OC truck that changes their specials all the time and each of their specials are better than the last. 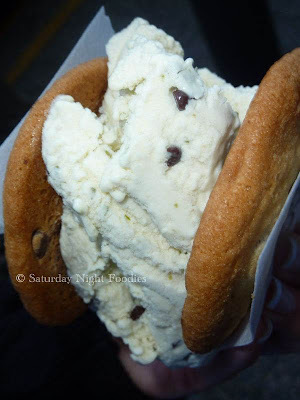 There is an LA truck that architects unique, homemade ice creams with a variety of cookies into delectable ice cream sandwiches. How about an LA pizza truck that arguably has better pizza than you can find in Chicago or New York? There are even a few celebrity trucks as they have been featured on several TV shows. A few are racing across the U.S. in Food Network’s Food Truck Race. Furthermore, there is also a truck that has put a Korean twist on a Philadelphia classic. If you want tacos, then you have a lot of eclectic choices – one is even known for using Filet Mignon. There will be a bakery/coffee shop on wheels offering tons of different sweets and coffees to tempt anyone. Lastly, there will be an OC truck making its debut at the OC Foodie Fest! I could keep going because there are 40 more spectacular trucks that will be there as well. Chris, over at TheFoodTrucker.com, put together a very fun OC Foodie Fest food truck checklist. It lists all of the trucks participating and the type of food they offer. It will help you keep track of where and what you ate. Click here to download. We have been lucky enough to try many of the trucks that will be there tomorrow. Here are two lists we put together. The first, are trucks that we have been craving to try. The other, are trucks that we can’t help but go back to, time and time again. There are a ton of great trucks and you can bet that we will get to every one of them at some point. I know what you are thinking, that is a lot of food! The best advice we can offer is bring your friends so you can share and sample many things. Gourmet food trucks are popular for a reason. We look forward to seeing you tomorrow. If you see us, be sure to say hello!